Suzanne Wynn describes a traditional way to eat like a prince and help solve the world’s food problems all at the same time. Plenty of plants, not much meat and maximum variety – the mantra for Enlightened Agriculture and thankfully, as Colin points out, the basis of traditional cooking the world over. However, meat, and in particular The Roast, has long played a central role in British food culture and so this article begins the exploration of how our current meat consumption needs to change if we are to feed ourselves in 2050 by looking at meat from sheep. In the Middle Ages Britain’s wealth was founded on the wool trade and even today we have far more sheep than any other country in Europe. We have 40 native pure breeds, more than any other country in the world, which are ideally suited to the terrain where they first evolved. 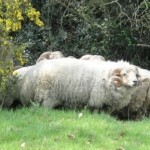 There are also 12 recognised crossbreeds, accounting for about 40 per cent of the national flock. Sheep play a vital role in managing the countryside, much of which depends on grazing, but 70 per cent of the sheep meat produced in the UK now comes from lowland sheep, even though this is land that is most likely to be suited to other forms of agriculture. Dorothy Hartley’s Food in England features a very comprehensive section on mutton beginning with the caution “do not treat all types of mutton in the same way”. This is followed by a discourse on various breeds and rearing methods, then recipes divided into two sections: mountain mutton and fat stock mutton. She observes “whereas in the mountain mutton the job was to get enough fat to cook it with, with the fatter mutton, the job is to keep it from being too greasy”. This distinction seems to have been forgotten, and most people assume that any mutton must be very fatty. 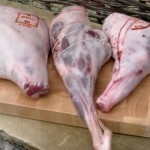 The following picture shows three legs of lamb from different areas of Somerset, each slaughtered at around 15 months of age. The first, and fattest, is a crossbreed from the Brendon Hills, whilst the second and by far the leanest, is a Shetland from the Mendip Hills. The third is also a crossbreed from the salt marshes near Bridgwater Bay. It is quite obvious when you look at the three together that the Shetland needs more protection than the other two. This is typical of pure breeds as most cross-breeding was intended to increase the meat yield. Hugh Fearnley-Whittingstall is of the opinion that mutton from a two-year old wether can be cooked quickly and served pink, like lamb. However, the only mutton I have ever been served rare was tough and chewy. I confess I have no idea of the age of that mutton, or for how longed it was hung, but long slow cooking is my preferred method for mutton. Earlier this year I took a group of students from Italy’s University of Gastronomic Sciences to visit some British producers. One of the topics we looked at was this subject of eating older lamb. First they ate two-year old Portland mutton, casseroled in a cream and mushroom sauce. Given their expectation that it would be fatty, the cream was unexpected. However, the Portland breed evolved to live on the scrubby vegetation covering the limestone rock that is the Isle of Portland and, although the beast we ate had been reared on kinder terrain near Lyme Regis, Portlands are genetically slow to fatten and thus very lean and in need of this type of protection during cooking. These distinctions have been eroded over time by our preference for young lowland lamb but I hope this article has whetted your appetite to taste different breeds from a variety of locations. My conversations with farmers of traditional breeds have often come round to a discussion about cooking. I always make a point of asking how they themselves would cook the meat because I am sure that many of the bad experiences people have had with mutton come down to problems in this area. If I may offer an example, there is now an association to market Exmoor lamb by name. Historically marketing was not the farmer’s job, and it is interesting (although also depressing) to see how many of the new breed of farmers have marketing backgrounds. The ideal scenario seems to me to be when the younger generation bring this aspect to a traditional farming background. Back to the Exmoor lamb, one person has recognised the need for better marketing and is offering to do this role for a number of farmers. What he hasn’t done yet is to sufficiently distinguish between the different farms – there is a great deal of difference to the cook between lamb that has grazed mainly on heather moorland and that which has grazed on the lower pastures. The pure breeds need also to be distinguished from the mules. However I understand that to many consumers this information would be meaningless, but that, to me, is the purpose of the marketing literature, which should always include cooking suggestions. So, as my own starting point for appreciating mutton, I offer a classic recipe of a steamed mutton and caper suet pudding. I recommend this for a lean upland breed, although by part cooking the meat in advance there is an opportunity to remove any fat that has risen to the surface before steaming the pudding, which would not preclude a fatter lowland breed. The suet pastry gives an opportunity to reacquaint ourselves with another marvel afforded by mutton – the hard fat that encases the kidneys and part of the loin. 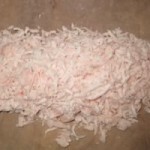 Fresh suet is a rare find nowadays, since most abattoirs destroy it as a waste product, but it is prized for its high burning point and makes pastry that is surprisingly light, non-greasy and fragrant. If you still have access to a butcher that slaughters (lucky you) he will be your best bet for obtaining suet, but by ordering in advance my butcher is able to request that his abattoir returns the suet with their lamb carcases. Suet is also found in beef, and although lamb’s suet would be better for this recipe, it is an alternative that you can consider for other recipes. I always make a point of requesting fresh suet for my Christmas Puddings and Mincemeat.